There’s a predictability to the new White Reaper LP, but the band’s core competency will likely keep most listeners from caring too much. Kentucky pop-punk quartet White Reaper tips their hand during the opening bars of their first proper LP, White Reaper Does It Again. The crashing drums, overdriven guitars and distorted melodies behind the simple arrangement of album opener “Make Me Wanna Die” barrel without interruption through the rest of the album’s pithy 34-minute runtime. This, it soon becomes clear, will be a record with no surprises -- and no tricks. More importantly, this will be a record where nothing is wasted. Every major power chord, cymbal splash and jangly mod-inspired keyboard riff snaps into place exactly where it should. There’s a predictability to this approach, but the band’s core competency will likely keep most listeners from caring too much. By bringing remarkably strong fundamentals to the party, White Reaper Does It Again makes a convincing case for itself despite its reluctance to stray from a familiar template. As the title suggests, there is not a world of difference between this record and the band’s eponymous EP. White Reaper did it once, the logic goes, and now they’re doing it again. This time, though, they’re doing it smarter. (With the band’s considerable tightening in mind, White Reaper Does It Better might be a more appropriate title.) The spirit is much the same here, and so is the form, but it’s drawn into sharper relief. The manic breathlessness that defined that first EP is found here in songs like “I Don’t Think She Cares" and "Last 4th of July", but their energy feels more deliberate. Where White Reaper indiscriminately sprayed its infectious hooks like buckshot, White Reaper Does It Again streamlines the band’s frequently very good ideas into a more legible format that honors Tony Esposito’s considerable knack for songwriting. The best example comes toward the back end, on barn-burner “Don’t You Think I Know?” Here the group channels its momentum into the richest and most soulful chorus White Reaper has managed in their young career. Each song has its own version of this bullseye moment, where melody and muscle crash into each other with enough force to justify the more prosaic elements (like the many familiar chord progressions) that lay the tracks for the collision. White Reaper’s taut aesthetic and want-not philosophy recall a time when punk music, even at its most pop-minded, was self-contained and profoundly un-fussy. To this end, the band wears their influences proudly on their sleeve. A cursory glance at the tracklist, with songs like “Sheila” and “Candy”, suggest an indebtedness to the Ramones that is confirmed by the time Esposito’s first melody resolves itself. Like those of their spiritual forebearers, a White Reaper song is a sort of elegantly uncomplicated system designed to light up listeners’ pleasure centers without too much ceremony. Specifically, these 12 songs recall a more polished Ramones on their Phil Spector-produced breakout End of the Century: it’s less bratty, more deliberate, and a slender pop record at its core -- classic Top 40 radio cleverly embedded into the sound of youthful indifference. You might call this sort of blatant hero worship uninspired, if it didn’t sound so confident, competent, and comfortable in its own skin. 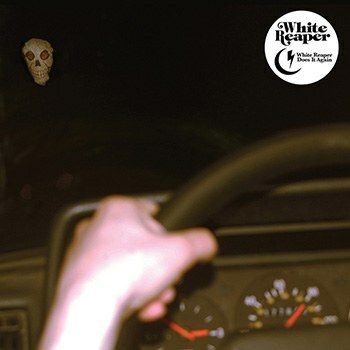 Bucking the trend driving much of the current garage rock renaissance, there is nothing psychedelic or cerebral about White Reaper. Here they have made a muscular, traditional genre record that isn’t interested in reinventing the wheel as much as it is in using it as efficiently as possible. They’re a stubborn band, in many ways, wholly uninterested in reimagining the tradition in which they’re working. But what White Reaper lacks in inventiveness, they make up for in unfiltered charm and poise. The album does nothing in the last 32 minutes that it doesn’t do in the first two, but the whole runtime is so fundamentally satisfying that getting hung up on its orthodox formula feels joyless and dumb. In this way, White Reaper Does It Again recalls the simple pleasure of eating a fistful of marshmallows. It might not be food, exactly, but it’s delicious all the same.